Monster Cable and its accomplices continue to rip off unsuspecting consumers, charging $119.99 at retail for a 2-meter HDMI cable (there's its portrait at left). Oh, wait, Amazon sells that same Monster Cable for $75.88. 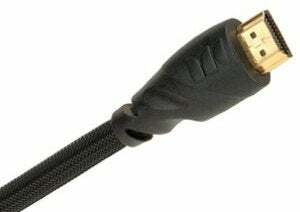 On the other hand, Firefold sells a 6-foot HDMI cable for $5.71, the lowest price we've seen yet. That's a difference of $73.17. Why is this price gouging continuing? As Ars Technica so deftly postulated yesterday, there's no difference. We figure the best we can do to help the situation is to get the word out. And you suckas who think there's a diff, well, I'll sell you my HDMI shorts for $89.99.